Czech Games Edition’s Galaxy Trucker ($4.99) is out on iOS. This board game port has a lot more features than most, and has a solid sense of humor to help you endure the frozen wastes of the void. When I say a lot more features, I mean it. This board game doesn’t just have online multiplayer and it doesn’t just have AI opponents. 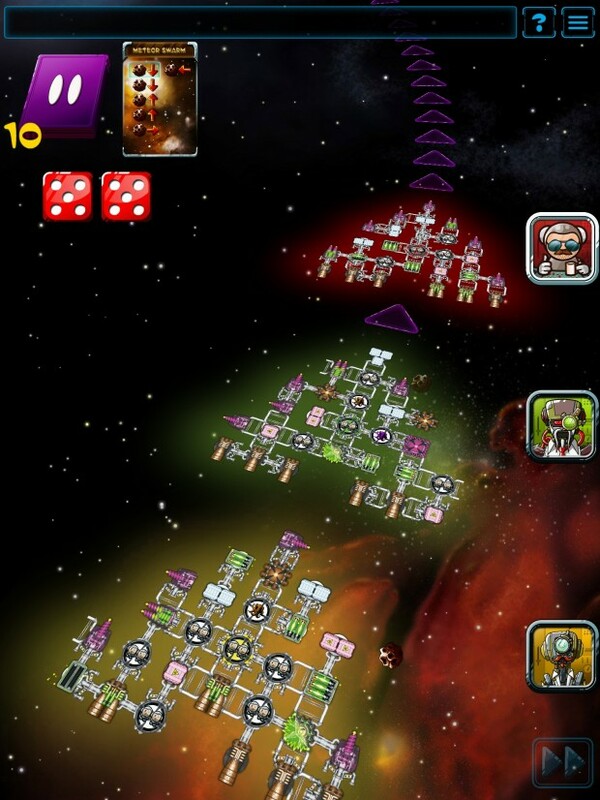 Galaxy Trucker features a full on campaign mode on top of all that. This thing is so full-featured, I am certain that many people will pick it up and only realize later that this is based on a board game at all. 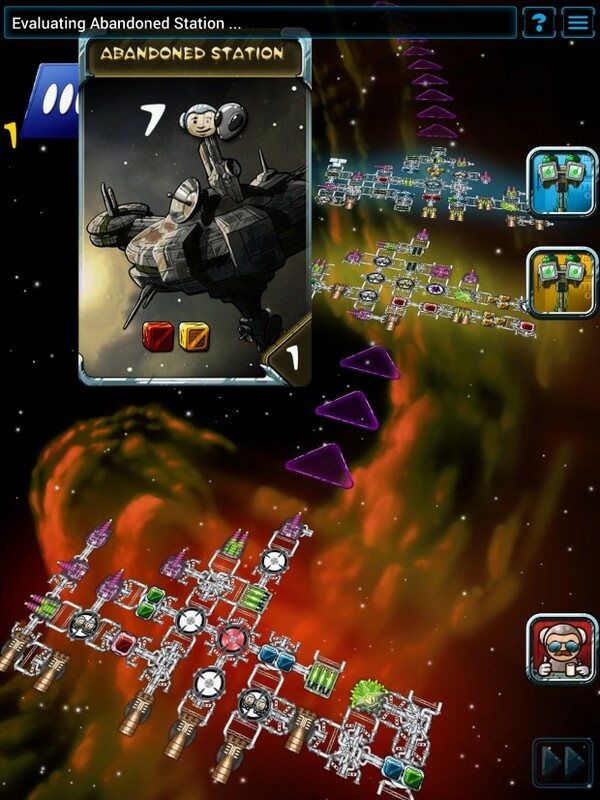 Galaxy Trucker, the app, has very few things I can nitpick about it. Solid controls, clear visuals, the truckload o’ features, and enjoyable gameplay are all on tap. Galaxy Trucker, the board game, does have some bits and pieces I don’t enjoy very much, but I still can appreciate this fun, if flawed, game. The game in either format consists of 2 phases: build phase and adventure phase. 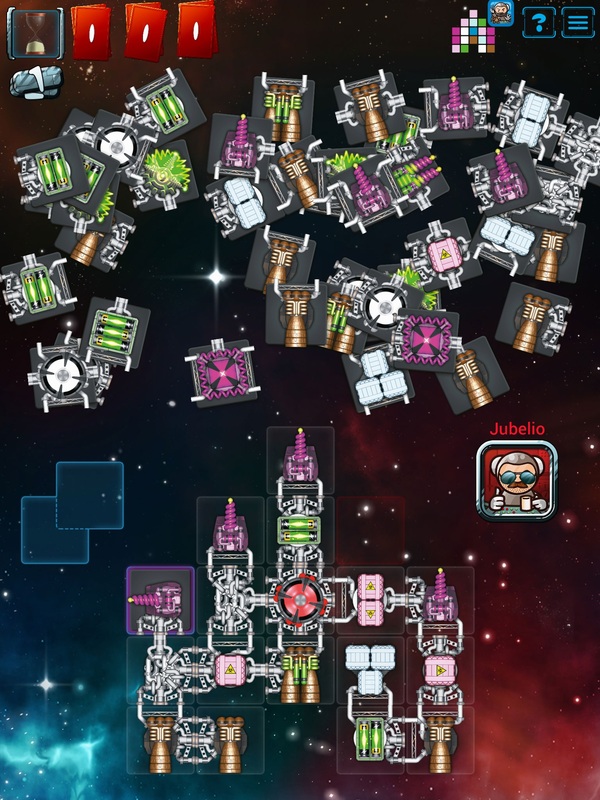 In the build phase, you need to build your ship out of tiled pieces that each perform a specific role. Storage, batteries, crew quarters, and shields are all best placed in the meaty interior of your ship while engines in the back and guns basically anywhere along the perimeter make for a good base design policy. Once your monstrosity is built, you take it out on the trail to try and rack up more space points than your opponents. One card is drawn in each round of gameplay and, depending on what the card is, could spell out rich reward or catastrophe for your intrepid crew. Once all event cards are played, you have reached your destination and points are tallied for the position you finished in, the state of your ship, and the amount of credits and resources you managed to gather. Once points are tallied, the winner for the round is declared. Some games will stretch over multiple builds/adventures and point totals carry over. Building your ship in real-time mode is an all out sprint to assemble something that won’t fall over to a stiff breeze. While you get plenty of time in the tutorial and campaign modes, multiplayer games move much faster. With a big advantage for finishing first, the ship you end up with may not be anything close to whatever you might have planned. 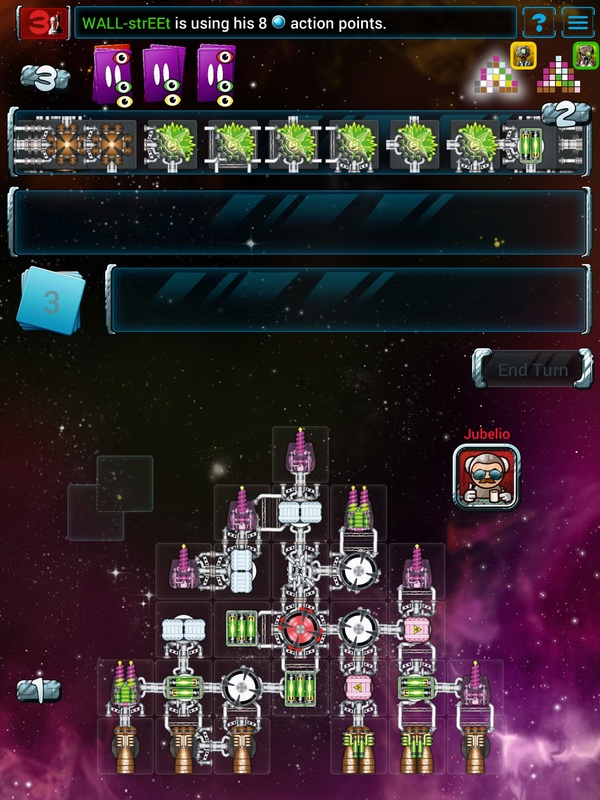 I have to say that the sacrifice you make for going slow and creating a very solid ship is usually not worth it. The upside to this is that there is a turn-based mode for those of us who prefer a tactical approach. In turn-based, you get a certain amount of action points each round. Action points can be spent to turn over part pieces, put parts on your ship, or spy some of the cards that will be in the game deck. It is truly rewarding when you can create a well-rounded and well-designed ship, and probably the highlight of the game for me. Once your ship is built, you are off to the races. In general, the leader of the pack is subject to the most events and will benefit the most from a solid design. Gameplay seems a little too lopsided to favor whoever is in the lead. If you begin to lag behind, your opportunities to generate resources or money are all dependent on the whim of players in front of you. Every once in a while you get a turn that can change this, but they seem to be too few and far between to impact any type of strategy you wish to employ. I would love to be able to strategize for a slow, more complete build that is designed to win from the back or to start behind and pull ahead over time. By the time you manage to put any solid amount of distance between yourself and your opponents, the round is usually about over. If I had to crystallize the strategy of the game into a single sentence I think I could do it: Build as solidly as possible while still finishing first. There just doesn’t seem to be much strategy after the build phase, you need to push to the front if at all possible because the line leader will almost always have the advantage. Adventuring in the campaign mode will bring you face to face with the creatively scripted NPCs as well as a gradual introduction to the different ship sizes that are available in multiplayer. You hop from planet to planet picking up quests with unique objectives from said NPCs. Playing multiplayer requires creating a login with Czech Games Edition’s system. This is a relatively painless process but one thing I noticed is that the form requires you to identify as male or female. I realize that for many of us, thats not a cause for concern, but I can also understand why this is problematic. I probably don’t need to go on about it much more than I hope that this changes in future updates. One of my only problems with Galaxy Trucker is that it almost translated too smoothly into app form and fell victim to some common pitfalls native apps sometimes succumb to. The graphic quality of the game seems weak and the simple cartoony presentation is a very common theme among low quality iOS games. Even though the app carries over much of the original game’s artwork, I am not a fan. It doesn’t feel like it has a solid or consistent style. It ultimately feels weaker visually than some other board game ports that have come before. With a good deal of attractive gameplay elements I think it’s possible to overlook the game’s shortcomings and have a good time. The campaign especially gives a lot of replayability you don’t normally see in the typical board game port. Galaxy Trucker has already gathered quite a loyal fanbase in our forums, but I definitely see some room for improvement. With that said, a fantastic list of features and generally enjoyable gameplay really power through the distractions for me and deliver a fun experience.